Home / Income / Smoking Hot Dividend Stocks: Altria Co.
Watch any period drama on television, from Mad Men to Boardwalk Empire, and you’ll notice one striking difference between our world and the one portrayed on-screen – smoke. Most of the characters on-screen in these shows are smoking nearly incessantly. It doesn’t even matter if the character is good or bad, male or female. People smoke nearly as much as they drink soda or talk about sports. That’s because a few decades ago smoking was far from a public health hazard. It wasn’t even unfashionable. People smoked all the time, everywhere, even in front of kids. No one seemed to bother. Somewhere along the way we realized just how hazardous this habit really was. Sun-dried and roasted leaves of tobacco packed neatly into tiny cancer sticks were public enemy no.1 in the 90’s and early-2000’s. Public perception had switched completely. Suddenly, smoking wasn’t just uncool, it was outright reckless and uncouth. The change in perception has had a dramatic effect. Since the 1940’s the prevalence of smoking has been cut in half. According to the Center for Disease Control, Only 16.8% of U.S. adults smoked in 2016. Smoking isn’t just down here. It’s been on the decline for decades in both UK and Australia. In fact, almost all developed countries have seen a decline in smoking. But if smoking rates are declining, the health hazards are obvious and there’s substantial regulatory pressure, how is big tobacco doing? Here’s a closer look at one of the most resilient and fascinating industries in the world. Last year the company declared an astounding net margin or 36.5%. Sales were close to $17 billion and net profit was a jaw-dropping $6 billion. Reynolds was the one of the largest tobacco companies in America till 2015. In 2015, it paid $29.25 billion to buy it’s closest rival Lorillard Inc. The tobacco industry is rolling in profits despite severe restrictions on its marketing and promotions. The industry is nearly as concentrated as it is profitable. Across the world six major tobacco firms drive the global epidemic of smoking: China National Tobacco Corporation, Philip Morris International, British American Tobacco, Japan Tobacco International, Imperial Tobacco and the Altria Group/Philip Morris USA. The industry is perhaps the most resilient in the world. Despite a slowdown in sales in the developed world, big tobacco firms have shifted their attention to developing countries. In lesser developed countries there are fewer restrictions on their marketing and pricing, which has helped the industry grow at an annual rate of 2% since 2009. Meanwhile, the industry keeps pumping money into lesser-known tobacco alternatives. E-cigarettes, for example, have already attracted a ton of cash from all the major tobacco firms in the past few years. Perhaps the most interesting aspect of the tobacco industry is the loyalty of its consumers. Smokers are extremely loyal to their brand of choice and are unlikely to give up smoking even when the taxes raise the price of a cigarette beyond affordability. With pricing power, lack of regulation, and a loyal customer base, the industry has flourished. One of the few beneficiaries of this lucrative trend have been investors. In this series, we’ll be taking a closer look at some of the big tobacco companies listed in America. Starting with one of the biggest – Altria. For decades, there was one name that stood out above all others in the tobacco industry – Philip Morris. That brand is now owned by Altria, one of the world’s largest cigarette and tobacco manufacturers. Virginia-based Altria is a multinational smoke-induced behemoth. Last year, the company made $25 billion in revenue and $5 billion in net profit. A margin of 20%. Diluted earnings per share was up 8.2% from the previous year. These profits show up in the company’s dividends. 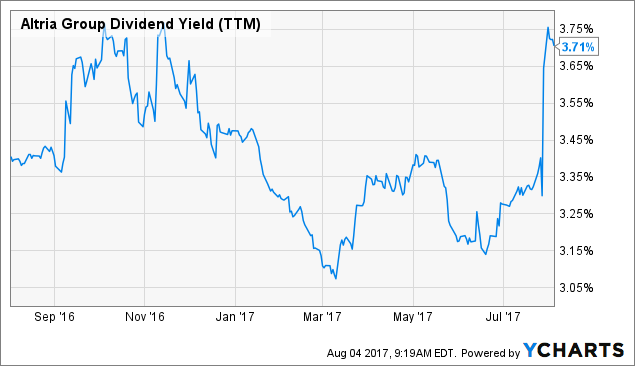 Over the past year, the altria stock dividend yield has hovered around 3%. This year the share price has been volatile enough to have an impact on the altria stock dividend yield, which now stands at 3.7%. Altria has been a wealth creation engine for its investors over the past decade. 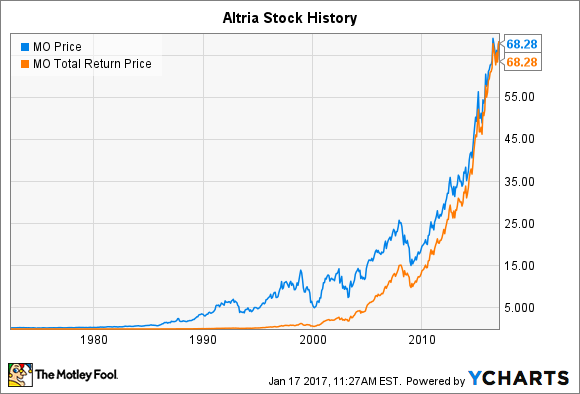 The total return (which combines the Altria stock dividend and price appreciation) has been phenomenal over the past few years. $10,000 invested in the stock in 2012, would have turned into $28,000 by now. That’s an annual rate of 11.77%. Altria now operates more than just a massive global tobacco manufacturing service. It owns a brand of e-cigarettes, smokeless cigarettes, popular wines, and even some beers. The company has been diversifying for the past few years and it seems to be paying off well. However, Altria’s exceptional performance isn’t a new phenomenon. The stock has been consistently rewarding shareholders for more than half a century! Since 1962, the stock has returned an average of 20% every single year. No other stock comes close to this return over such a long period. It’s this sort of performance that compelled Wharton professor Jeremy Siegel to label MO the best performing stock on the planet. Absolutely no stock is worth buying if it’s trading at the wrong price. Despite its remarkable success and resilient economics, Altria should only be considered if the price is right. Now, there’s no way the company can repeat the phenomenal success it has had over the past half century. 20% compounded annual would be brilliant, but unlikely now. So, let’s assume the sales and profits expand barely more than inflation for the next few years. Although the debt level is low and the Altria stock dividend enjoys healthy coverage, there are inherent risks with tobacco. Anything could go wrong and sudden change in regulations could have a drastic impact on the company’s prospects. So, a weighted average cost of capital between 6% and 7% seems appropriate. Finally, assuming EV/EBITDA multiples and profit margins remain stable for the next few years, we can apply a discounted valuation model to the Altria stock dividend. According to these assumptions, the intrinsic value is $104. Considering the stock currently trades at $65, it is undervalued by at least 35%. The Altria stock dividend seems like a great investment opportunity for income seeking investors. It’s undervalued and has a great track record of rewarding shareholders who remain loyal. However, it’s hard to overestimate the tough regulations and tricky environment this industry operates under. Recently, the Food and Drug Administration or FDA declared it would crack down on the industry. New guidelines suggest the regulator could compel tobacco firms to cut down on the amount of nicotine in each cigarette. When the FDA’s plans were announced tobacco stocks took an instant beating. Altria stock was down 20% in the morning, before ending the day 8% down. Other tobacco stocks performed similarly. New, tighter regulations could have a serious impact on these companies’ profit margins and cash flows. However, the industry has faced much worse before. Altria has survived drastic steps and public outcry for decades. Now, new regulations could take much longer to kick in. Meanwhile, Altria continues to preserve the Altria stock dividend with diversification into alcohol and smokeless cigarettes. Nevertheless, the stock isn’t for the faint of heart. Tobacco is a fascinating industry. No matter what we throw at it, smokers keep smoking and the industry keeps pulling in cash. Altria is one of the biggest and most well-known tobacco firms on the plant. Most of its revenues are derived from the manufacture and sale of cigarettes and tobacco-related products. Over the past half century the stock has performed brilliantly. There’s a chance it might not perform as well in the near future. Restrictions are growing and the prevalence of smoking is declining worldwide. Nevertheless, Altria is on track to diversify its assets. It holds a serious stake in the beer industry and a popular wine brand. The stock is currently undervalued by a wide margin. If these diversification plans work out as expected and regulations remain impotent, the Altria stock dividend could be a worthy addition to your dividend stock portfolio. I’m surprised to see tobacco industries growing their income. Nowadays, I see less and less people smoking compared to 10 years ago.